At Dial a Bin, we provide the businesses of Milton Keynes with a reliable, cost-effective, waste management solution. Whether your business requires regular commercial wheelie bin collections or roll-on roll-off skips, we are able to help. We offer collection and disposal of both non-recyclable refuse and recyclable materials for a whole host of industries, from retail units to restaurants and pubs. As a business ourselves, we know how important it is that your suppliers are reliable and also flexible. So, if you’ve been let down by your current waste management company, give us a call and we’ll be happy to help you in any way we can. Our skip hire service accommodates all businesses across Milton Keynes and our roll on-roll off skips come in sizes of up to 40 yards, making them perfect for any project that you may be undertaking. We provide both open-topped and enclosed RO-RO skips, depending on whether your refuse needs to be protected from the lovely British weather. 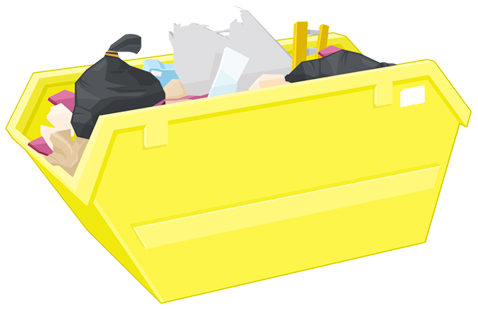 The collection of your skip can be arranged around your requirements and if you wish to have your RO-RO skip on a long-term basis, then the collection and delivery can be scheduled around your waste production. Along with our variety of RO-RO skips, we also have commercial wheelie bins available to hire with a capacity of up to 1100L. With flexible hire periods of up to 14 days available, you’ll find that we are one of the best options for skip hire in Milton Keynes. With fly-tipping becoming more of a problem across the UK, we feel it’s important that our customers know that Dial A Bin is a permitted waste carrier. Since January 2014, as part of a government initiative to reduce fly-tipping and to help to protect the environment, it has been a legal requirement for anyone carrying waste to obtain a permit. By checking that the company you employ to manage your waste has the appropriate permit, you can be confident that your waste will be disposed of properly and with minimal impact to the environment. You can find ours here. Along with our skip and wheelie bin hire services, we also aim to recycle as much refuse as physically possible. The recycling team at our licensed waste transfer station find new uses for a large portion of the waste that we collect, meaning the absolute minimum goes to landfill. For further information on our reliable, cost-effective waste disposal methods and available skip sizes please browse our site or get in contact on 01908 041628.